The star’s bail had been set at $1 million, of which he was required to pay 10%. His lawyer Steve Greenberg who has called his client’s finances “a mess” maintained the chart-topper’s innocence. Kim Foxx the state’s attorney for Cook County, which includes Chicago told journalists the alleged crimes occurred between 1998 and 2010. The charges carry three to seven years of prison time each. Kelly, then 27, had produced the teenage singer’s debut album titled “AgeAin’t Nothing but a Number.” Their marriage was later annulled, and Aaliyah died in a plane crash in 2001. Last month’s release of the “Surviving R. Kelly” series once again brought accusations against him to the fore. A #MuteRKelly movement aimed at preventing his music from airing — has gained steam. 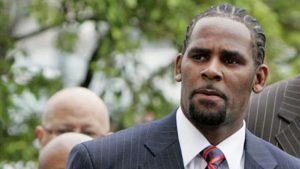 The post R&B star R. Kelly freed on bail, denies sexually abusing children appeared first on SABC News – Breaking news, special reports, world, business, sport coverage of all South African current events. Africa's news leader..